For a lot of investors, purchasing stocks that pay a dividend is the only game in town, but like any game there are always the pros and cons of every approach. One of the drawbacks to dividend investing is that there are a multitude of stocks to choose from that pay a decent dividend but the company itself may be in a precarious financial situation and that quarterly payout may just be temporary. About a year ago, I was surprised when I published an article on high-quality dividend growth stocks, and it went on to receive the most page views of anything I have ever published on Seeking Alpha. This is a new version of that article. Many dividend growth investors try to stick to really high-quality stocks. They prize quality as much as yield, dividend growth rate, and valuation when they are selecting stocks. There are nearly infinite ways to define quality, of course, but many investors utilize independent gauges of quality as part of their process. The last factor is new this year. Last year I displayed Simply Safe Dividends’ scores, but I did not use them in the ratings. In the ensuing 12 months, I have come to see them as quality indicators in their own right, and so this year I added them to the scoring factors. 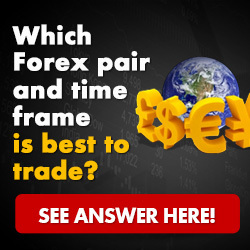 You will find descriptions of the proprietary quality factors at the end of the article. To identify the highest-quality companies, I used only the top two grade levels for each of the five factors. Companies falling below those levels on any factor were eliminated. The top companies got 5 points on every factor for a maximum score of 25. The lowest qualifying companies got 4 points on every factor for a total of 20. I often use 5-level grading systems. For this exercise, qualifying companies must be in one of the top two grading levels on every factor. That is, they must get 4 or 5 points on each of the four factors. A 3 on a single factor knocks a company out. These are stringent tests. Many well-known companies of undoubted quality did not make the cut. Examples would be Altria (NYSE:MO), AT&T (NYSE:T), General Mills (NYSE:GIS), Lockheed Martin (NYSE:LMT), McDonald’s (NYSE:MCD), Qualcomm (QCOM), United Technologies (UTX), and Verizon (NYSE:VZ). Most of the knockouts were on account of credit ratings. I created charts for each of the qualifying groups (25, 24, 23, 22, 21, or 20 points) to show how each company scored. In the charts, the following data fields are also provided, but they did not play a role in the scoring. Years of increasing dividends. Note that companies with streaks less than 13 years did not increase their dividend during the Great Recession. Yield. High yield is not an indicator of company quality, but it is an attribute that investors often seek. Here are the highest-quality dividend growth companies under this system. This select group of 11 companies got the highest score on every factor. This group includes the only two companies in the world with AAA credit ratings (Johnson & Johnson (NYSE:JNJ) and Microsoft (NASDAQ:MSFT)). 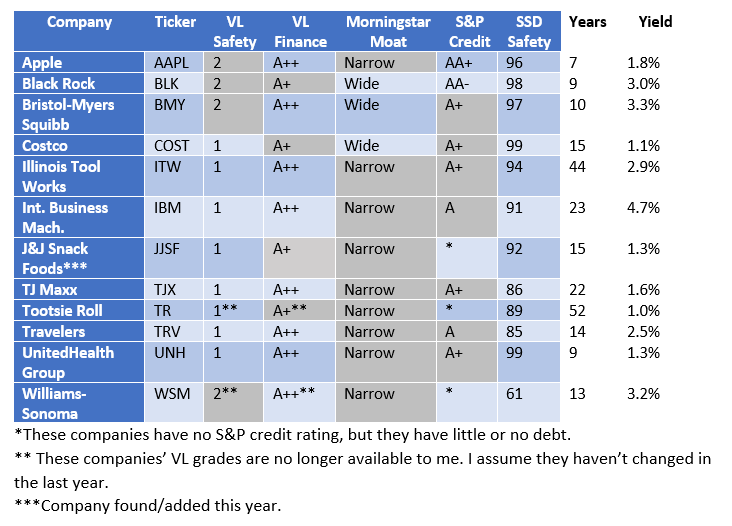 There are two changes in this top group from last year, both based on new credit ratings. Coca-Cola’s (NYSE:KO) credit rating dropped from AA- to A+, so Coca-Cola drops out of the top group this year. Visa’s (NYSE:V) credit rating rose from A+ to AA-, resulting in Visa’s promotion to this top group. Each company in the highest group is a household name, for good reason. These are great companies. It is not often that you can find one of these companies at a bargain valuation. Everyone knows how good they are. The companies in this second group missed a perfect score on just one factor. I shaded the cells that show which factor bumped each company down. Usually it was the credit rating (which is why Coca-Cola fell into this list from the top list). Three companies left this group since last year. Starbucks’ (NASDAQ:SBUX) and United Technologies’ (NYSE:UTX) credit ratings fell to BBB+, taking them out of the rankings entirely. Visa, on the other hand, saw its credit rating upgraded to AA-, resulting in promotion to the top group. Raytheon’s (NYSE:RTN) moat was upgraded from Narrow to Wide this year, so RTN was promoted to this group from the next group down. Jack Henry (NASDAQ:JKHY) was also added. It’s either newly qualified or I simply missed it last year. Three companies (marked by * in the S&P Credit column) have no S&P credit rating, but their debt (as shown on FASTGraphs) is zero. I decided not to penalize them for the lack of a credit rating. You, of course, might decide differently. These companies fell short on two factors, which are indicated by shaded cells. The two most common areas in which companies fell short are in their moat rating (having a Narrow instead of a Wide moat) and credit rating (being at the A level instead of AA). Several companies are no longer in this group. Three were demoted to the next group. Kimberly-Clark’s (NYSE:KMB) VL Financial grade fell from A++ to A+ this year. W.W. Grainger’s (NYSE:GWW) VL Safety grade fell from 1 to 2 since last year. Franklin Resources’ (NYSE:BEN) moat rating went from Wide to Narrow this year. Fastenal (NASDAQ:FAST) has no S&P credit rating. Last year I let it through, but this year I decided to eliminate such companies if they have non-negligible debt. Fastenal has 18% debt/capital per FASTGraphs. I still let Tootsie Roll (NYSE:TR) through with 1% debt/capital. On the upgrade side, Raytheon’s moat was raised from Narrow to Wide this year, so RTN was promoted into the next-higher group. Also, J&J Snack Foods (NASDAQ:JJSF) was found this year. These companies fell short on three factors, again shown by the shaded cells. All of the companies in this group fell short of a top-level (AAA or AA) credit rating. 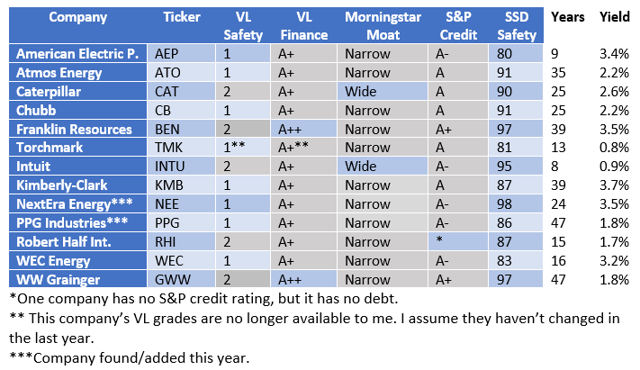 Most also have VL Finance grades of A+ (instead of A++) and Narrow moats (instead of Wide). This group lost two stocks to this year’s new metric, Simply Safe Dividends’ Dividend Safety score. Aon (NYSE:AON) and Xcel Energy (NYSE:XEL) have been dropped to the next group on that basis. Lowe’s (NYSE:LOW), which was in this group last year, was eliminated entirely, because its credit has been downgraded to BBB+. While that’s still considered “investment grade,” it’s below the standards being applied here. Additions to this group include the three companies knocked down from the group above, plus NextEra (NYSE:NEE) and PPG (NYSE:PPG) which were found and added. These companies fall have the second-highest rating on four of the five quality factors. All the low-scoring cells are shaded. This group lost Qualcomm (QCOM), because its VL Safety rating was lowered to 3. Therefore it was removed from the rankings completely. It also lost JPMorgan Chase (NYSE:JPM) to a low Dividend Safety score, giving it a 2nd-category score on all 5 factors. JPM was therefore dropped into the next group. Aon and Xcel Energy fell into this group from the group above. 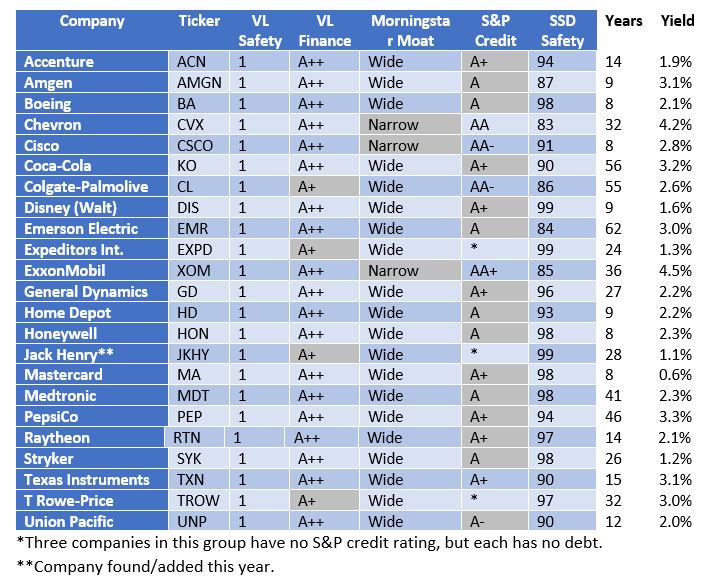 Because of the stringency of the scoring system, most of these companies – even those in the final chart – would be considered “high quality” by most investors. That said, perform further due diligence before investing in any of them. Quality is only one of many factors to consider, and there are many ways to measure quality besides the ones used here. Other areas to investigate include the whole dividend picture, whether the company fits with your portfolio’s function and your own personal goals, and each stock’s valuation. Quite a few ingredients go into Value Line’s Financial Strength ratings. Balance sheet leverage, business risk, the level and direction of profits, cash flow, earned returns, cash, corporate size, and stock price, all contribute to a company’s relative position on the scale. The amount of cash on hand, net of debt, is an important consideration…. For financial services providers, such as banks, thrifts, and insurance companies, the amount of capital, as measured by the equity to assets ratio, is a key consideration. More capital is better from a regulatory standpoint, but too much cuts down on profitability. Loss reserves are important, as well, as are funding sources. For lenders, deposits insured by the U.S. government represent a firmer source of liquidity than borrowings. It’s when liquidity dries up that disruption occurs in the credit markets. It’s important to note that financial strength doesn’t always translate into stock market outperformance…But, for investors looking for dividend-paying stocks and stocks to hold on to for a long period of time, it pays to be aware of a company’s financial standing. Morningstar’s Economic Moat rating is a proprietary data point from Morningstar, which is another independent analytical firm that has been in business since 1984. “Economic moat” is a term Warren Buffett uses to describe the sustainability of a company’s future economic profits…We see the primary differentiating factor among firms as how long they can hold competitors at bay. Only firms with economic moats-something inherent in their business model that rivals cannot easily replicate-can stave off competitive forces for a prolonged period. In this article, I only used companies with a Wide or Narrow moat rating. A firm without an economic moat cannot be considered “high quality” for the purposes of this article. Standard & Poor’s bills itself as the world’s foremost source of independent credit ratings. The company has existed as an independent financial analysis provider since 1941. 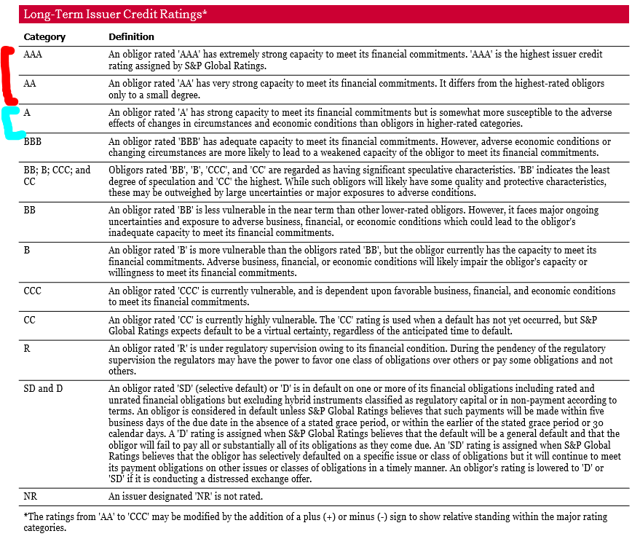 S&P credit ratings are forward-looking opinions about the creditworthiness of an obligor. The opinions reflect S&P’s view of the obligor’s capacity and willingness to meet its financial commitments as they come due, and may assess terms, such as collateral security and subordination, which could affect ultimate payment in the event of default. In this article, I used the AAA-AA ratings (marked in red) as the top category and A (marked in aqua) as the second category. No other companies qualified. The sub-designations “+” and “-” were ignored. SSD’s ratings have been developed by Brian Bollinger, who is a contributor here and at Daily Trade Alert. SSD takes multiple factors into account, including payout ratios, debt levels, cyclicality, free cash flow, and performance during recessions. Scores range from 0 to 100. A score of 50 represents a borderline safe payout, but conservative investors are best off sticking with companies that score over 60 for Dividend Safety.